Blog Story about Small Business Sunday Award! I was working in my office on Sunday 11 February. Listening to music and catching up on lots of shows and events. I flicked into Twitter! I love Twitter! I noticed a Tweet from Theo Paphitis about applying for a Small Business Sunday Award that day! I had seen a few tweets in the past but never thought about entering the competition. 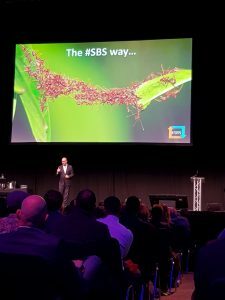 I clicked onto his website and thought WoW I would love to be an #sbswinner – What a wonderful way to celebrate your business and all the hard work that goes into running a small business. It also looked to be an amazing community of passionate small business owners and a great opportunity to network and share hints and tips. 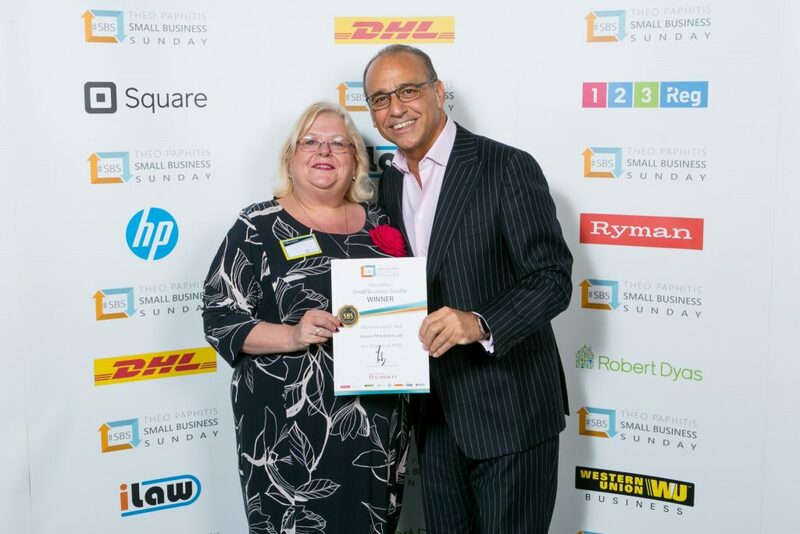 To enter the competition you have to tweet @theopaphitis between 5.00pm and 7.30pm on a Sunday. 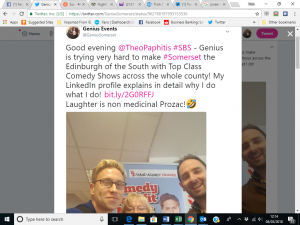 Make your tweet interesting, use an image and a bit of humour or topicality plus a link to your website from your Twitter profile…then leave it for Theo to make his choice! The winners are announced on the Monday at 8pm. I had forgotten all about it by then. I was at the theatre that night watching Michael McIntyre from the front row. Big laughs and a brilliant evening. In the interval I quickly checked my mobile….BLIMEY!! Over 250 notifications and almost 100 new followers in the last hour! The second half of the show was awesome and I felt so happy anyway! When I got home from the theatre I spent a couple of hours thanking everyone for the messages and responding to emails. 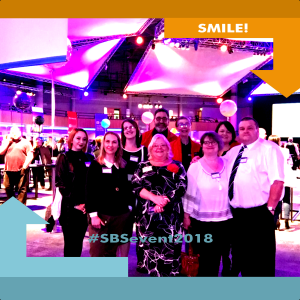 Tuesday evening I joined #sbswinners hour on Twitter – Wow what a marvelous group of inspirational people! I was also granted access to a Private Group on Facebook for SBS Winners. I was also sent an email from Theo to add my profile to the SBS area of his website. 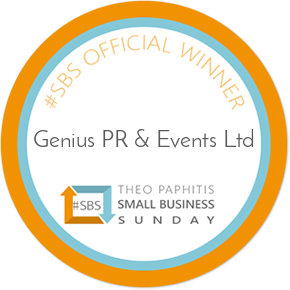 PLUS I was sent a Winners Logo for all my social media and websites etc and an Invitation to the #SBS Winners event in Birmingham on 23 February – just 12 days after winning. Such a blur of activity. 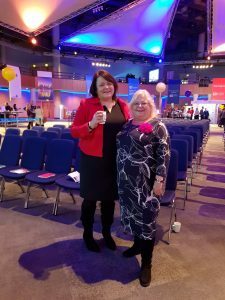 My lovely friend and business partner Fran Carey accompanied me to Birmingham for a day with Theo and all the other winners. We had a long drive, leaving Taunton at 06.15 in the morning. We stopped at Gloucester Services (I had never been before) – Wow! We arrived in Birmingham around 9am and made our way to the ICC. Lots of happy, smiling people wandering around and networking over coffee and biscuits. 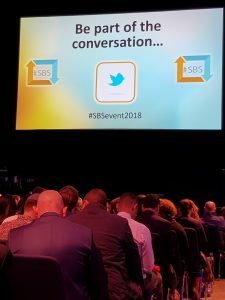 There were ‘Meet the expert’ sessions and workshops and exhibition stands – #SBS Speed Marketing and Ecommerce Sessions and #SBS Break out Presentations – So lots to do before the main event when Theo would take to the stage. His speech was truly inspirational. Made us all want to cheer. What a passionate businessman. He made all us small businesses feel like Kings and Queens of the UK Economy! There was a nice break for a yummy buffet lunch and a glass of wine. There was a selfie photo machine and as many West Country winners as we could round up squeezed in for a group photo. 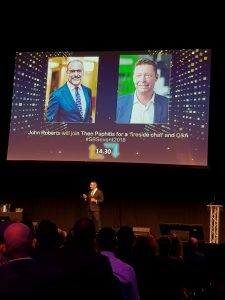 In the afternoon, Theo interviewed AO.com’s John Roberts and then he and John took business-related questions from the floor. A very interesting discussion and I can’t wait to go again next year! Then it was time to queue up for our personal photos with Theo. Such a true gentleman, warm and kind. I don’t think I look very good in photos, however, I am thrilled with the official one! In conclusion I have to say that this is the award I am most proud of in all my years in business. 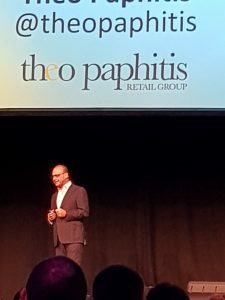 Theo is a very highly regarded businessman and he says he chooses winners that exhibit true passion in their own business and why they do what they do! I need to find a way to build on this award and truly push Genius PR & Events to be the best that it can be! I would also like to publicly thank Fran Carey for her friendship and support. 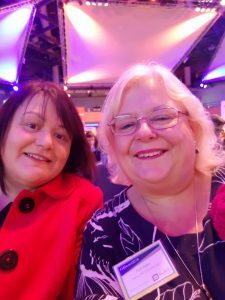 APART we are both successful business women in our own right…TOGETHER – Blimey what a TEAM!  We compliment each other styles and skills and make an incredible team….TEAM GENIUS! We are extremely well connected across Somerset. We work with all the venues and are able to secure very attractive deals. Do get in touch if you have any questions, we are always happy to help.